New York Times bestselling author Susan Mallery’s newest Fool’s Gold story proves that wild hearts cannot be tamed… Horse whisperer Shane Stryker is done with passion. This time around, he’s determined to meet someone who will be content with the quiet life of a rancher’s wife. And the fiery, pint-size redhead who dazzles him at the local bar definitely does not fit the bill. Small-town librarian Annabelle Weiss has always seen herself as more of a sweetheart than a siren, so she can’t understand why Shane keeps pushing her away. Shane has formed the totally wrong impression of her but only he can help her with a special event for the next Fool’s Gold festival. And maybe while he’s at it, she can convince him to teach her a few things about kissing on hot summer nights, too-some lessons, a girl shouldn’t learn from reading a book! Let me start out by saying that this is my favorite Fool’s Gold novel! I fell in love at the first pages and couldn’t put it down till the end. (I even love this cover the best! Look at those colors). We met Shane in Summer Days (Review here) and I knew he would be an amazing character. He’s the middle brother, the guy with the horses, the gorgeous cowboy with a beautiful heart. (Seriously, this man is worthy of serious swoonage. The 911 calling type of swoonage). He’s been hurt before so when he sees Annabelle he’s smitten but completely cautious. He wants a quiet, reserved girl this time around, so why can’t he get Annabelle out of his mind? Annabelle is Fool’s Gold librarian. She is the quiet, reserved type, except for that one night when she decided to prove a point. Little did she know, the man that captures her heart saw her wild side, and now things she’s too wild for him. Shane and Annabelle’s relationship is outstanding. This book made me laugh and cry and cry from laughing so many times. The tension between the two is so thick and powerful it should be illegal to pollute the atmosphere that way. Susan is an artist with her relationships. Every person in this book is important and amazing. She has a way even with her secondary characters that makes you root for them. In conclusion, this is my favorite Fool’s Gold novel! Wait, I think I may have said that already. Well, it’s so good it was worth saying twice. And maybe three or four times as well. Susan does not disappoint. 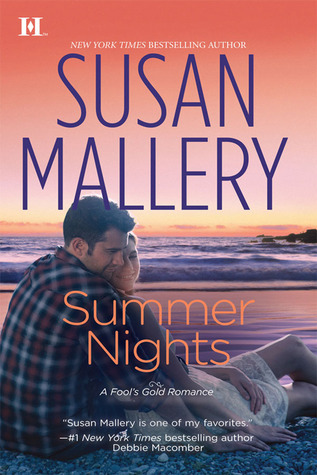 If you enjoy a beautifully crafted romance, with characters that touch your heart, Summer Nights is for you! Out today! Get it, read it, love it! Thanks for the terrific review! Glad you enjoyed SUMMER NIGHTS. Great review! Summer Nights was such a great book. I absolutely loved Annabelle and Shane's story!